The 2019 Farmers Insurance Open will be played at Torrey Pines, with each golfer playing one round on the North Course and one round on the South Course before a standard cut to the Top 70 and ties. With the two-course rotation, selecting golfers on the right course will again be more relevant for Showdown and 1st round leaders than it will be for the main slate DFS contests. The South Course will be played both rounds on the weekend, and is one of the ten hardest courses on tour relative to par, the longest in par adjusted distance, and has inside the top 10 most narrow fairways at the midpoint. Given the challenging scoring environment, eagles and birdies will be fewer and further between, meaning that placement points for winning the event will be critical for both cash games and tournaments. The weather looks quite pleasant with no advantage for either draw and is nice enough to make you want to move to Southern California. Tiger Woods is back in the field for his first event of the 2019 season. In addition to Tiger Woods, it will also be the first event for several other golfers inside of the Top 25 in odds for this field. 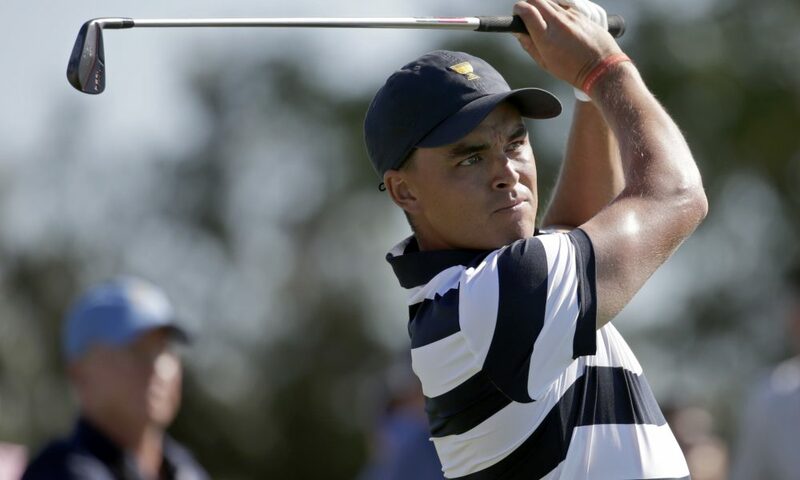 Tony Finau, Rickie Fowler, Alexander Noren and JB Holmes will all be playing their first event on the PGATOUR this season. On the flip side, Jon Rahm, Marc Leishman, Gary Woodland, Patrick Reed and Brandt Snedeker are a few notable names that have played at least two events while Charles Howell III continues to grind out paychecks with his fourth straight event this week. San Diego native Pat Perez who spent every day working at Torrey Pines in high school withdrew from last week’s Desert Classic but looks set to play an event where he has made the cut 7 of 9 times including two Top 5 finishes and three other Top 25 finishes. The strokes gained data for this event features just one round for those who miss the cut and three rounds for those who play to the weekend. 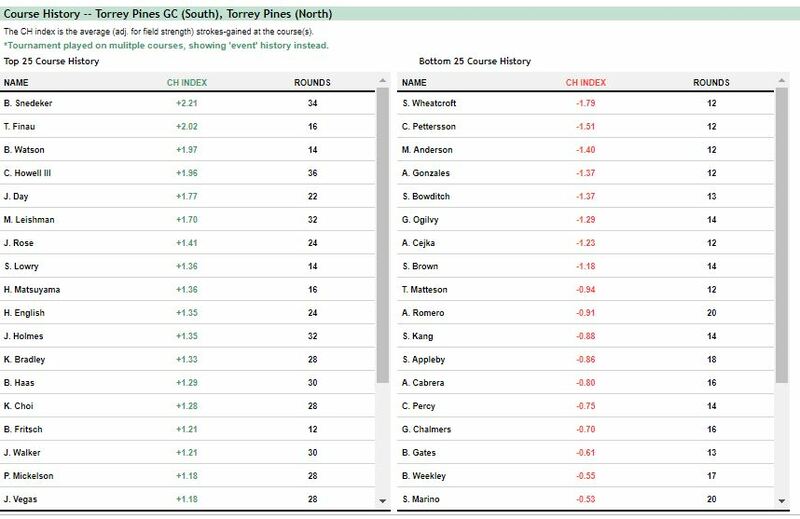 Leveraging the historic event data at DataGolf we can see that the overall variation in scores is driven more from putting and approach play than a typical tour event, with less emphasis in off the tee play. This is a bit counter intuitive given the length of the course, but the leaderboards have featured a wide variety of players. Jason Day (W-MC-MC-W-2-9) and Brandt Snedeker (Two wins and 9/10 Made Cut) have both won here twice. Neither player is known for strong off the tee or approach play as much as they are for world-class short game via around the green play and putting. While names like Snedeker and Day pop, there are also ball strikers with strong total driving and iron play such as Tony Finau (6-4-18-24), Charles Howell III (10/10 made cuts with 5 Top 10s), Justin Rose and Hideki Matsuyama, and then an enigma like Bubba Watson. At the top end of the field most of these players are capable of contending at any event, but at the bottom end of the field for value selections it may be worth focusing on guys that have outliers skillsets in one of the key areas versus mediocre all-around play.